New research has revealed that grocery retailers in the UK are struggling to meet customer requirements and are at risk of failing to deliver on their brand expectations. Sounds like a retailers worst nightmare, so what’s the cause behind this? Retailers say it comes down to poor-decision making and legacy supply chain infrastructure. We know that customer expectations are changing retail and that most customers expect the choice of ordering online, or going into a physical store. The challenge facing most businesses as a result of this, is their ability to make goods available (either on the shelf or online) when the customer really needs it. This is the current challenge for UK grocery retailers. 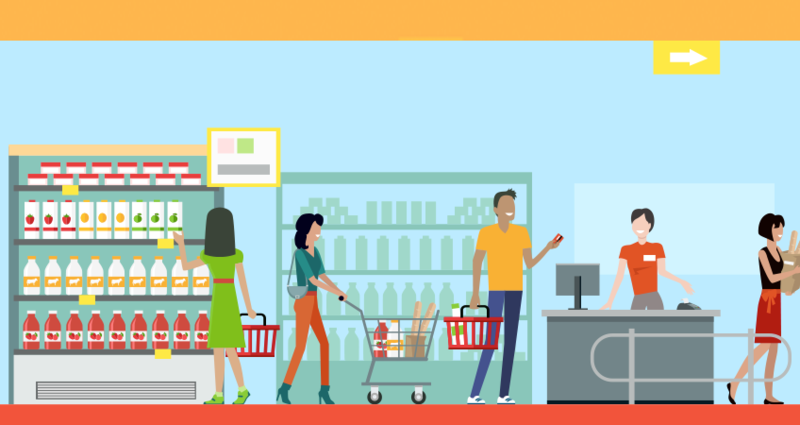 90% of grocery retailers said they had issues rising to these customer expectations. And it doesn’t stop there. One in five retailers also feel that they do not deliver product at the speed the customer demands. So it’s true. The clock-speed expectation of customers and their demand for instant gratification is placing pressure on retailers across the UK. This is surely staggering to many business owners, but maybe we can look at it as an opportunity to grow rather than an unsurmountable, thorn-laden mountain. Luckily we were taught by the Stoics nearly 2000 years ago that there are things both within our control and out of our control. We know that we can no longer control consumer buyer behaviour; that changed irrevocably with the advent of eCommerce. So what can we change we hear you ask? These are all things within the control of your business that can be changed and improved on to ensure you can keep up with rising consumer demands. But there is one thing that still might hold you back. Legacy infrastructure. Let’s take a look at how legacy infrastructure may be impacting your on-the-spot decision-making. If the cause of your delayed decision-making is a result of legacy supply chain systems, then it might be worth replacing them with components that are more flexible, functionally rich and interoperable. The aim is to achieve high levels of agility so your business can respond quickly to rising customer expectations. If you feel that your legacy systems can provide you with that opportunity, then read no more. However, if you see your supply chain as a strategic asset and competitive weapon to give your business more of an edge in a global market, then adopting a platform-based approach may be the solution to optimising your processes. A platform-based approach means you will essentially rely on software integrations to speak to other areas of your business to cope with challenges and complexity. But how does this help in supply chain management? Adopting a platform-based approach for supply chain management can assist you in achieving whole-chain awareness, allowing you to function in a omnichannel and multi-channel world. If the biggest crux to retailers today is making better (and informed) decisions on the fly, then ensuring you have the right visibility of your supply chain operations is a must. But it shouldn’t just stop there. If you really want to deliver what your customers expect, you’ll need to understand total inventory levels in each category of your business. In 2015, Woolworths announced it had chosen TradeStone’s Merchandise Lifecycle Management platform to manage their supply chain. This platform gave them the ability to manage suppliers, orders and B2B sales with the rest of business financing. The logic behind this decision was grounded in the fact that the TradeStone platform would allow Woolworths to use a single platform across all divisions and product categories. We may not all be as big (or have the same budget) as Woolworths, but this is a good demonstration of how software platforms can help your business. We here at CeMAT know that delivering products doesn’t stop at the four walls of your warehouse, so it’s important to make sense of all the data from every aspect of your supply chain. And finally, there is one important aspect you should consider before you rip out all your legacy systems and replace them with a shiny new software platform. You may only require a system that can build on from your current capabilities. It’s important to gain an understanding of how your supply chain is currently operating, where you think you need to improve in order to scale, and how a platform can either replace or improve current operations.